This is either an interesting work of art, an ancient mutant human, or an alien. 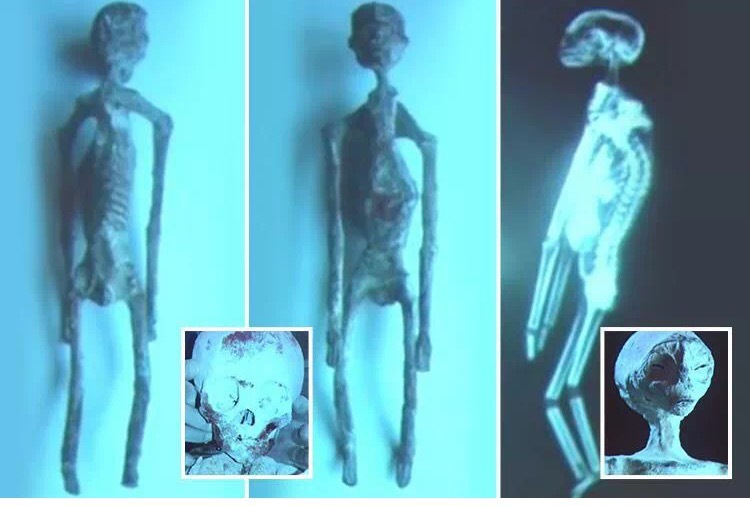 UFO fans are going bonkers over a video of a tiny, three-fingered humanoid found in Peru – claiming it might be proof that aliens once lived on our planet. But others claim it could just be a crude fake – a plaster cast made up to con people into paying to attend a conference. 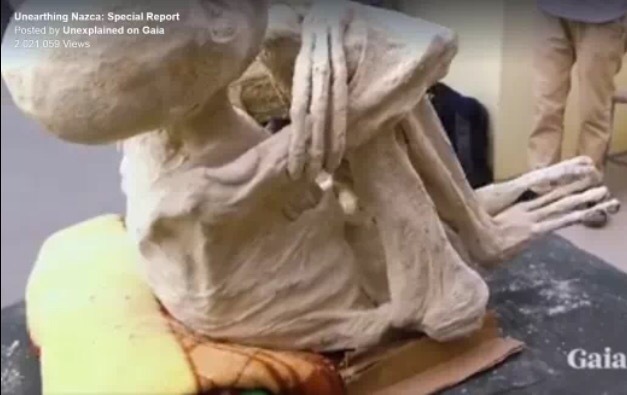 The new, tiny humanoid (allegedly) unearthed in Nazca, Peru by ‘investigative journalist’ Jaime Maussan – who showed off two other mummies last month. Naturally, the usual UFO sites are more than happy to believe it’s a find which could rewrite human history, with Ancient Origins saying, ‘We should keep an open mind’. Others are sceptical. Much more sceptical – pointing to the fact that the video’s creators are trying to charge people up $300 (£232) to attend a conference to discuss it. 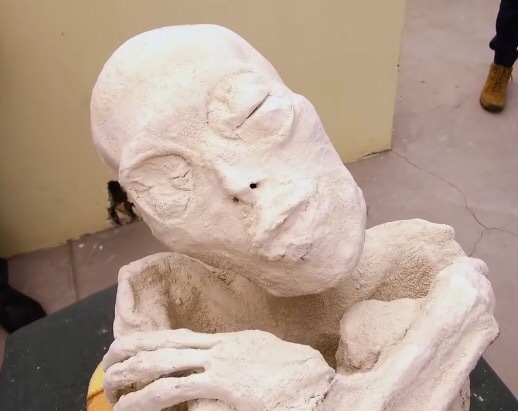 Nigel Watson, author of the UFO Investigations Manual, says, ‘Looks like a plaster cast model to me. I’d call it a 110% fake! … ‘Anything associated with Jaime Maussan a serial promoter of fake alien evidence is suspect. I’m going with the work of art theory on this one, as those toes look completely impractical. 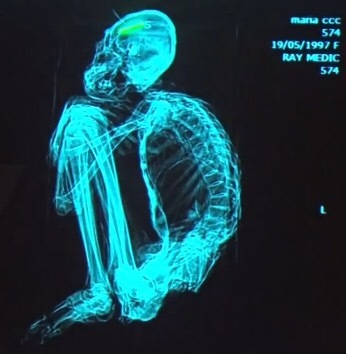 There appear to be real bones from a CT scan, so it’s an awesome forgery if that. 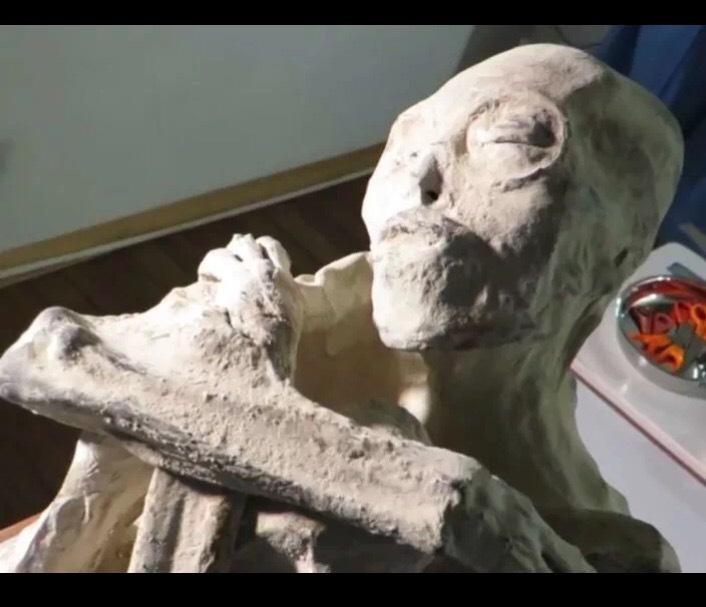 Maussan and his colleagues first announced the discovery of “well preserved alien” remains in June. According to Maussan, the five feet, three inches tall mummified corpses had belonged to non-human beings with three long fingers and elongated skulls. He claimed that a total of five preserved “alien” bodies were found and that three of the bodies had reptilian characteristics. Rodolfo Salas-Gismondi, from the Paleontology Department of the National History Museum of Peru, who is also an associate researcher at the American Museum of Natural History, contradicted M.K. Jesse’s analysis, insisting that the structure of the hands of the “reptilian aliens” was fundamentally incorrect when assessed from the perspective of biological or evolutionary science. Salas-Gismondi claimed that the so-called “reptilian alien” remains were, in fact, sophisticated forgeries constructed by an artist using bones obtained from different sources, including children’s and animal bones. Looking at the wrist area x-ray, I agree. It’s just an illogical jumble, not a real animal’s wrist. The white powder is supposedly something to preserve the tissues. If there is a grey skin underneath as reported, it would be even more interesting. Looks like a badly put together collection of different bones by someone making a weird art project. Totally unfuntional. No knee caps, wrist or ankle bones, ribs all wrong. What a wretched creature if it was one. Interesting. I agree that the wrist bones don’t look like wrist bones at all, more like parts of phalanges that have been tossed in carelessly. If it’s a hoax, though, someone’s gone to an incredible amount of trouble producing it. It’s difficult for me to imagine what would motivate a person to create a hoax in the first place. Maybe there’s easy money in it, but I have my doubts. I doubt there’s easy money in anything, especially lies and deception. But what would I know?